Providing a complete overview of our services covering all of your smoke ventilation system needs. 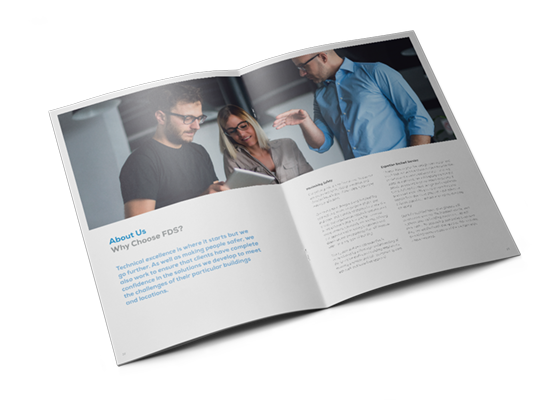 The new Fire Design Solution brochure offers an insight into our full service offering, whether that be design, specification, supply, installation, commissioning, project management or even service and maintenance. Fire Design Solutions aim is to give you a smoke ventilation solution that is reliable, effective and compliant. One that fits the building in question so well, it not only exceeds all building regulations but provides an effective and unobtrusive solution. Would you like a physical copy to thumb through? No problem! Simply follow the link and submit your details and we'll get one sent out to you on the next post. 152-154 London Road, Greenhithe, Dartford, Kent, DA9 9JW.